February, 20, 2019 – As in previous editions, Piovan do Brasil, an associate company of the multinational Piovan S.p.A., will be exhibiting at the Plástico Brasil show in Sao Paulo from 25 to 29 March: the Brazilian event is a strategic opportunity for the whole Group to display its most innovative technologies and further reinforce its links to the key regional players. Piovan Group will be on stand G106 with the Piovan, Aquatech and Energys brands. Folowing the course of Industry 4.0’s smartfactories, visitors will be able to experience the live demo of Winfactory 4.0, the digital supervision software designed to increase plants' productivity through the management and integration of all production process, as well as Winenergy, the plant-wide energy monitoring system. Piovan will also introduce Quantum E, the new gravimetric controller, specially developed for flexible packaging films. Still in the area of gravimetric control, the company will highlight Ryng, which is an instant raw material consumption meter for transformers; Ryng is a valuable item for process control for any industry 4.0 systems. Other highlights are Easy³+, the new solution for the management of centralized feeding systems with a 7” touch screen and the new DPA 100-200 compressed air dryer, with drying capacity ranging from 5to 40kg/h, consisting in 3 models. Under Aquatech brand, a company of the group dedicated to water cooling solutions, an exhibit will display Digitemp+, the new thermochiller with double circuit, which, according to the manufacturer, guarantees a higher production efficiency and shorter cycles; the MiniChillerEvo, which belongs to the line of portable chillers and Slim, the compact chillers line with high capacity will also be on display. Aryacool, a sustainable cooling solution, available in dry and adiabatic versions, offers numerous advantages for closed-circuit industrial water cooling, the company assures. For Piovan, Plástico Brasil will also be an important opportunity for presenting its new corporate and brand identity to the South American market, launching the completely renovated image that the Group introduced worldwide in January 2019. The new Piovan Group logo marks the birth of a new corporate identity for the leader supplier of auxiliary equipment, engineering solutions and services for the plastics industry, with the aim of giving even more incisive, direct expression to the strength, value and unity of the entire network, now able to cover 70 countries and employing more than 1,060 people worldwide. That is a result of a major change, based on a meticulous marketing study, constantly founded on the company's key values and pillars. The new logo is designed for use alongside a new symbol, a pictogram of three circles, evoking the Group's values, its current business sectors and its strong points. The pillars and drivers of the company's strategy are its customers, positioned firmly in the center of every process and decision, the people who belong to the entire network, and innovation with a view to continuous improvement and development, with more than 173 staff employed on research and development on a daily basis. The business sectors: plastics, food and cooling. Piovan has been working worldwide since 1964 with the plastics industry, specializing in the production of auxiliary equipment. 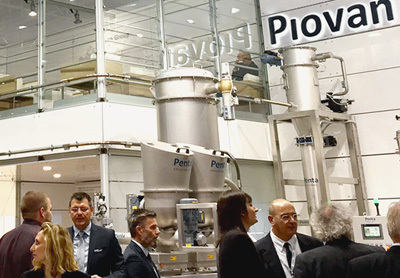 Today, thanks to the evolution of the organizational structure and major new acquisitions, Piovan Group has entered new strategic markets, including industrial cooling with state-of-the-art refrigeration systems, where high performance, optimization and energy efficiency are the fundamentals of product quality, and food, with the development and design of powder conveying systems for the food production sector. The strong points: global, service and teamwork. Thanks to continuous international growth, 7 production plants and 27 sales and service branches, Piovan Group has been covering all the main global markets. Piovan has 190 Service staff, ensuring global, swift coverage of its customers' needs. The re-branding process also marks an important evolution for the whole Group, enabling more immediate communication of its identity worldwide: from associates to customers to partners. The new corporate identity features simple, high-impact graphics and also involves all Group companies, with the strategic aim of integrating all brands within the same vision. Piovan, Una-Dyn, Fdm, Penta, Aquatech, Energys and Progema will retain their individual names, but will now use the new pay-off “Piovan Group”,to underline both their belonging and their independence, and emphasize the identity of a great Group. A new corporate website www.piovangroup.com and the thorough review of all communication materials were also developed.